Pitching a new company or design idea to influential businesspeople is a daunting task for many. But what may seem like a nerve-wracking ordeal is just another week at the J. Herbert Smith Centre at the University of New Brunswick. It’s a Thursday morning and three Master in Engineering, Technology Management and Entrepreneurship (MTME) candidates are pitching their business ideas to a panel of New Brunswick’s business leaders and managers. Four New Brunswick business leaders were on hand for the event: Adrienne O’Pray, president and CEO of the New Brunswick Business Council; Scott MacIntosh, founder of SwiftRadius and partner in Deloitte Consulting Canada’s Technology practice; Mike Oliver, UNB TME professor; and Beth Webster, vice-president administration for Populus Global Solutions. The panel quizzes the MTME candidates about profits, timelines, competition, and investments. “This is a great opportunity to learn and adapt from what these industry leaders are telling us,” Emmanuel Albert, one of the students and co-founder and CEO of Trispectra Innovation, says afterward. 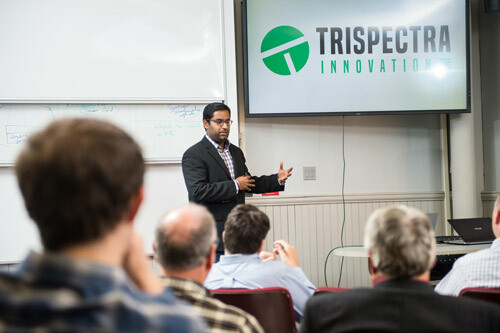 Trispectra Innovation is developing a sensor-based communication platform for utilities that automates fault detection on distribution lines. The company is collaborating with UNB Smart Grid Research Lab and the Smart Grid Innovation Network to continue product development and testing. The session is part of the curriculum. Each week, students meet with investors, business experts and industry partners to present and learn how to make it in the world of startups. The master’s degree builds on the success of the Technology Management and Entrepreneurship undergraduate program’s proven record of success, which has seen more than 30 startup firms launched in just the past five years – including successful startups such as HotSpot Parking, Resson Aerospace, Smart Skin Technologies, Castaway Golf Technologies, SimpTek Technologies, Wear Your Label and more. https://www.youtube.com/watch?v=k5NlK0ijL-k&feature=youtu.be Both programs are run through the university’s J. Herbert Smith Centre, named after the late Canada General Electric president and CEO who graduated from the Faculty of Engineering at UNB in 1932. Dr. Smith served 15 years at the top of CGE. His words and wisdom are some of the guiding principles in the centre today. The centre, chaired today by Dhirendra Shukla, is among a broad array of entrepreneurship endeavours responsible for the UNB being named Canada’s most entrepreneurial post-secondary institution by Startup Canada. Dr. Shukla says each business grows from the program. Students discover their passion and formulate an idea during their time in MTME. “The program is specifically designed so they can launch a company,” says Dr. Shukla. “The hope is they finish the program with their company and, fingers crossed, an investment.” Every week, the students pitch their companies, prepping them for the world of business beyond UNB. Aside from receiving feedback on the presentations, the students also get the chance to network and trade contacts with New Brunswick’s business leaders. “This truly is a partnership between the university, entrepreneurs, and the community at large.” On this day, there are two other companies under scrutiny. Phys Technologies has developed a mobile sensor that attaches to a variety of gym equipment to measure the speed and orientation of the load being lifted. It calculates the user’s power output during every repetition and provides feedback to the user through a smartphone app. Rising Tide Technologies is developing a new approach for energy extraction from tidal movements. The method aims to overcome adverse environmental effects and some technical limitations of existing approaches, as well as combine tidal power extraction with energy storage in pursuit of a green system capable of generating on-demand power. The students have the opportunity to mix and mingle with the business leaders. After the event, they shake hands, share advice and impressions, and pass along business cards.